No current (or power) is demanded from the source feeding the amplifier. There is no attenuation of source signal reaching its input. This signifies that the internal resistance of the source is not significant and might be quite high devoid of any detrimental effect. There is no limiting factor on the output current accessible from the amplifier. The amplifier can drive any load joined to it devoid of any loss of signal or restriction on the load. The amplifier can accept signals with limitless frequency content. In this, there is no limit on the rate of change of signal. All signal profiles are reproduced devoid of distortion. The voltage gain is recognized by component values selected by the design engineer. The gain must not modify with manufacturing variations in the amplifier. The gain must not depend on the load or source conditions. The properties of non-ideal amplifier deal with similar issues as those of a ideal amplifier however are finite and limited in their level. The input resistance is limited and finite. This signifies that the source should deliver a current to the input of amplifier. The input signal level existed at the input to the amplifier depends on the relative values of the amplifier input resistance and source resistance. As a result, there is an attenuation of the signal produced by the source on reaching the input of amplifier. The ouput resistance of amplifier is not zero although is finite. There is a limiting factor on the output current accessible from the amplifier. The power or current that can be delivered to the load is thus as well limited. Bandwidth is not infinite however limited. There is a maximum frequency that is passed by the amplifier with full gain. 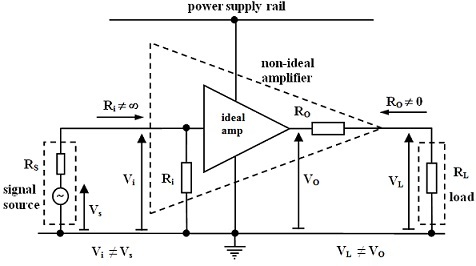 Frequency components exterior to the bandwidth of the amplifier are attenuated and this can lead to distortion of signal if the amplifier has inadequate bandwidth to pass the full frequency spectrum of the signal of interest. In simple amplifers developing variations in the semiconductor fabrication procedure give rise to big fluctuations in the amplifying properties of the devices employed to construct the amplifier. This gives mount to varition in the amplifer gain, A, that can only be overcome by more advanced design methods such as the utilization of negative feedback. The modern semi-conductor technology devices can readily be manufactured containing substantial gain and some can be combined in different circuit configurations to form amplifiers with higher gain whenever needed. The problem is that there are big tolerances related with the manufacturing process and as a result the gain of each transistor can differ widely, frequently by as much as a factor of 10:1. The variation is further aggravated with changes in operating temperature or supply voltage. This makes it unfeasible to design amplifiers with any accuracy unless a means of overcoming the consequences of such variations is found. The method is to manufacture integrated amplifiers with a very high gain, much higher than is needed in circuit applications, and then to employ negative feedback in the design of an amplifier with a stable lower gain for a specific purpose. 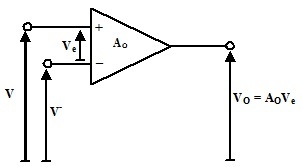 The block diagram of a general structure of a feedback amplifier is as shown in figure below. This comprises of an amplifier containing a voltage gain, AO. The amplifier will be taken as encompassing a very high input resistance and a very low output resistance and hence the effects of such can be neglected. In this structure, the input signal is not applied directly to input of the amplifier however to a summing unit, as shown. The output signal of amplifier is fed into the feedback unit. This unit just senses the output signal of the amplifier and produces a feedback signal that is a fraction, β, of the output (β is taken as real and ≤ 1), that is, Vf = βVo. The feedback signal is then fed into second input of the summing unit where it is initially inverted, and hence it is in reality subtracted from the input signal in the summing unit. This is why the feedback is termed as negative. The error signal, Ve , at the output of summing unit is then the difference among the input and feedback signals. 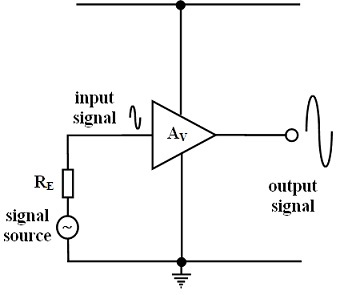 Error signal is then fed into the amplifier where it is amplified by gain, Ao, to produce the output signal, Vo. Consider modifications in the amplifier properties in such a way that the gain varies. When the input signal level is steady however the gain of the amplifier raises, then the output signal level will tend to rise. This in turn signifies that the feedback signal level will rise proportionately. The raised feedback signal level is then subtracted in the summing unit from constant input signal level to provide a reduced error signal. This reduced error signal emerges at the input of amplifier and when passed via the amplifier will tend to decrease the output signal level to counteract its original tendency to rise. Alternatively, when the input signal level is constant however the gain of the amplifier reduces, then the output signal level will tend to reduce. This in turn signifies that the feedback signal level will reduce proportionately. The decreased feedback signal level is then subtracted in the summing unit from the steady input signal level to give a raised error signal. 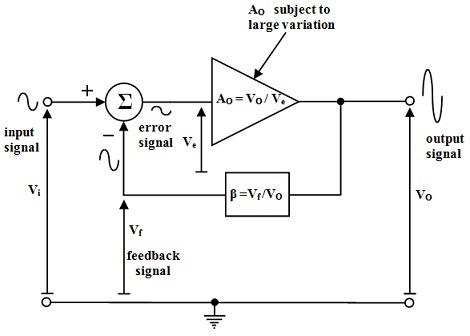 This raised error signal emerges at the input of the amplifier and whenever passed via the amplifier will tend to raise the output signal level to counteract its original tendency to reduce. As a result, the change in output signal level caused by the variation in gain of the amplifier is much diminished as compared to that which exists when no negative feedback is existed. Therefore, it can be seen that negative feedback decreases the effects of parameters variations in the amplifier. 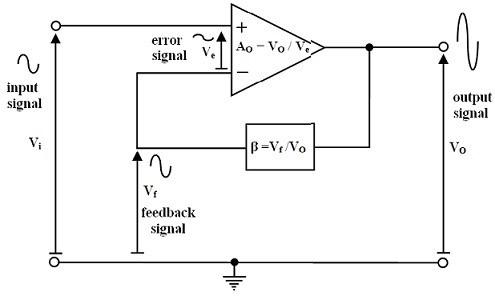 Operation of the feedback amplifier can be analyzed to determine the overall input-to-output gain or transfer function of the closed-loop system. The voltage gain of amplifier in isolation devoid of feedback applied. Input-output voltage gain of complete amplifier by negative feedback applied. The fraction of the output signal of amplifier that is fed back to the summing network. The fraction of an output signal of the amplifier that is fed back to the summing network. The operational amplifier is an integrated amplifier that is manufactured specifically for the purposes of designing negative feedback amplifiers as shown in figure above. This is a differential amplifier containing two input terminals and that's why two separate input voltages can be applied to it. The positive terminal is a non-inverting input and hence it influences the output in similar sense that is, an increase in the voltage V+ causes a raise in the output voltage. Negative terminal is the inverting input and hence it influences the output in opposite sense, that is, a raise in the voltage V- causes a reduction in the output voltage. The output voltage is thus the open-loop gain times the differential voltage as seen between the non-inverting and inverting inputs, that is, Vo = Ao ( V+ - V-). 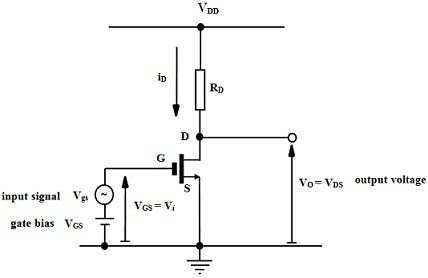 This signifies that the subtracting operation of the negative feedback amplifier can be executed by the operational amplifier when the feedback, βVo, is applied to the inverting input of the op-amp, as shown in figure below. The open-loop gain, AO, is deliberately made very high and hence the loop-gain, AOβ, can be made much bigger than unity even for the small values of β. This signifies that when the loop gain is much high the differential error signal present among the terminals of the op-amp, Ve= V+ - V- → 0. Basically, a negative feedback system is always trying to form the signal fed back to the inverting input of the amplifier the same as the external input signal applied to non-inverting input, that is, V+ = V-. This principle can be employed in the later analysis of op-amp circuits. Since the source impedance of electrodes can be fairly high, this requires very high input impedance in the amplifier. As seen formerly, this could reach to GΩ beneath severe conditions. Getting very high input impedance is not that hard with op-amp type circuits however for differential amplifiers, as would be employed in ECG monitoring, it can be fairly difficult to balance the impedance on both inputs. The bandwidth needs for most of the bioamplifiers are not extreme however usually require being higher than the highest frequency component in signal spectrum. This is in order to save phase distortion of the components at the higher end of spectrum. Such components are frequently related with minute detail at low amplitude in the biological signals and might have diagnostically significant information to be employed in a clinical environment. Any band-limiting taken out by low-pass filtering should use a linear phase approach like a Bessel-Thompson filter design. It should be possible to get sufficient gain over the bandwidth of interest. Operational amplifiers can contain very high open-loop gain at dc however this rapidly falls off with frequency. The measure of closed-loop gain that can be realised is given by the Gain-Bandwidth Product parameter for the op-amps that should be sufficiently high to meet needs. Most of the biomedical amplifiers will encompass to operate in a differential manner, evaluating the potential difference among two inputs. The body picks up signals, in particular mains supply interference, that is unwanted and present at both inputs. Transducers that use bridge arrangements in their construction as well contain large common-mode bias voltages at both outputs. The Bioamplifiers in common should contain a high ability to reject common-mode signals in the favour of wanted differential input signal and hence only the latter contributes to output. Tutors, at the www.tutorsglobe.com, take pledge to provide full satisfaction and assurance in Electrical Engineering help via online tutoring. Students are getting 100% satisfaction by online tutors across the globe. Here you can get homework help for Electrical Engineering, project ideas and tutorials. We provide email based Electrical Engineering help. You can join us to ask queries 24x7 with live, experienced and qualified online tutors specialized in Electrical Engineering. Through Online Tutoring, you would be able to complete your homework or assignments at your home. Tutors at the TutorsGlobe are committed to provide the best quality online tutoring assistance for Electrical Engineering Homework help and assignment help services. They use their experience, as they have solved thousands of the Electrical Engineering assignments, which may help you to solve your complex issues of Electrical Engineering. TutorsGlobe assure for the best quality compliance to your homework. Compromise with quality is not in our dictionary. If we feel that we are not able to provide the homework help as per the deadline or given instruction by the student, we refund the money of the student without any delay.